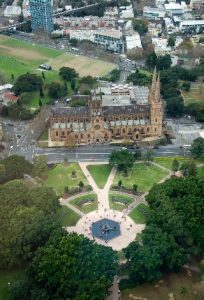 My third and final installment of photos from my trip to Australia last month ends on a HIGH as I snap some captivating shots from above. 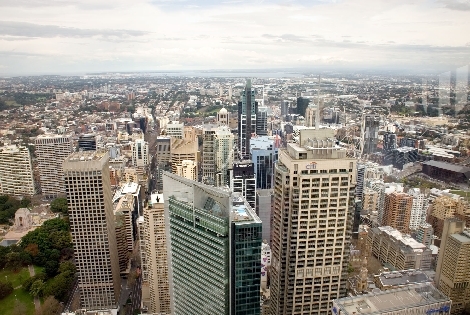 Sydney and district from above. 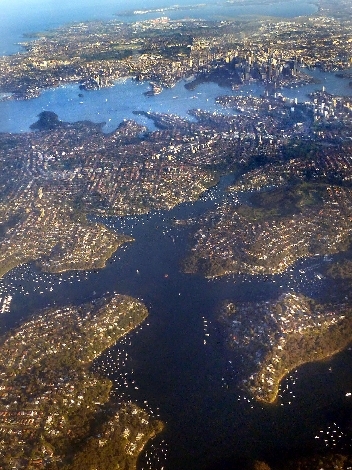 On the approach to Sydney Airport I got a lucky view out the plane window over the city. 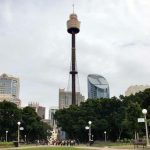 The city centre is towards the top right and if you look very carefully you may just make out Sydney Harbour Bridge, an imposing landmark if ever there was, for miles around. 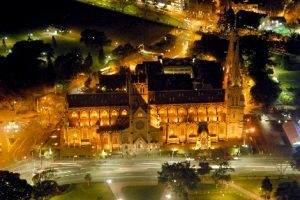 As I’ve said in previous blogs, I love taking shots out of aircraft windows, but by no means is a good shot guaranteed. You are sometime battling against sometimes poor light, engine vibration or air turbulence, but more often clouds, haze and most frustratingly, reflections on the glass. In a low flying privately hired Cessna you may be able to (and I have) briefly open and poke your lens out of the window, but alas they don’t tend allow this on a Boeing 737! 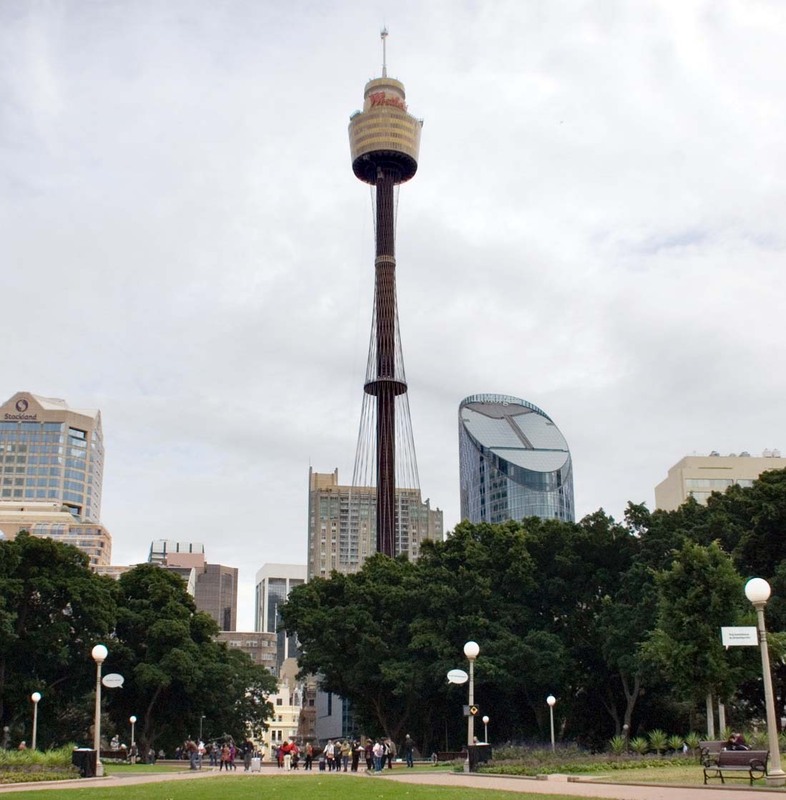 At almost exactly one thousand feet high, the Sydney Tower is the second highest observation tower in the southern hemisphere and an irresistible destination for me with camera. The weather wasn’t perfect but being cloudy at least let me have an evenly lit view, rather than having to worry about where the sun was. What was a nuisance was the fact that visibility wasn’t great, so photography was realistically of the city centre only. And waw, what a view it was! I was pleased with the results. Shooting through a window is never ideal, as reflections are then make or break of a good shot. Press your camera lens right to the glass and if necessary cup your hands round the outside so no reflections creep in. My first shot was of the city’s cathedral, which was almost immediately below and looked nice with the fountain in the foreground. Changing to a wider lens and we get a nice panorama looking down the river towards the sea. It’s a big and very spread out city, partly because there is so much water all around. Shots like this do benefit from a lot of editing in Photoshop (other photo editing software is available!) and I started by using auto levels on the distant horizon to add some clarity, being careful not to overdo it and make it look rather unnatural. Further round to the west and the scene becomes a mass of high rise blocks, not the clearest of shots and spoiled a bit by the reflections I couldn’t avoid on the right, but nonetheless a nice record to have. Looking towards the famous bridge. 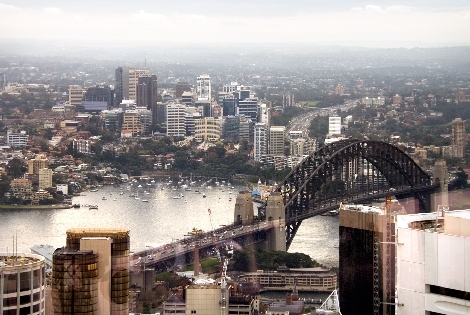 I really struggled to get a good view of the famous Sydney Harbour Bridge from my viewpoint in the observation tower, partly because it was very hazy and I couldn’t get rid of the reflections despite twisting my arms and body into contortions like a complete idiot to shield the lens! 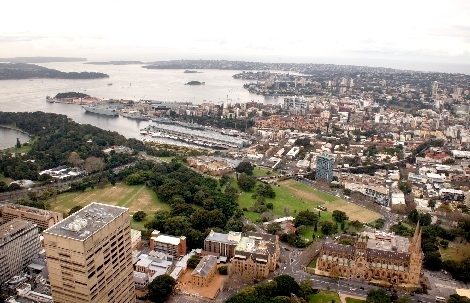 Also in that direction was a rather ugly tower block placed by some thoughtless planner encroaching into the view. 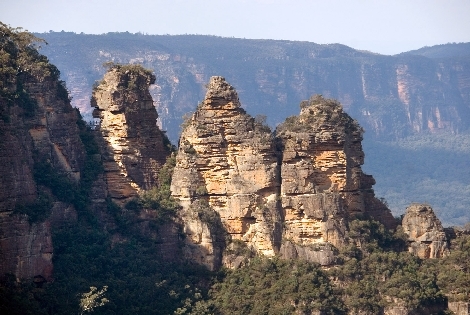 And now for something completely different… Leaving the city behind for a few hours I headed by train, on I believe, one of the world’s steepest mainline railways into the Blue Mountains. At nearly 3,500 feet above sea level and besieged by tourists, the ‘Three Sisters‘ rock formation is a must for a photo. These mountains have a particularly defined blue haze, due to evaporating eucalyptus oil (I really needed spell checker for that!) from the huge forest. I didn’t try to remove that digitally as it would have been ‘wrong’. To get my shot, I was actually a couple of miles away and using my trust zoom lens having waited patiently, for the sun at last, to have made an appearance. I really need the contrast here to show the rock surface. It also brings out the colours too. 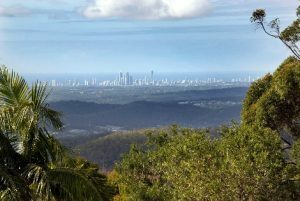 Another day trip, this time in a hired car, took me inland from the Gold Coast and up into the Mount Tamborine National Park and firstly calling at Eagle Heights where a great view could be had looking back down to the coastal resorts. I used some vegetation to ‘frame‘ the view and give the photo some depth. We’re now about 15,00 feet above sea level by the way and the view isn’t clear because it is about 15 miles away through the eucalyptus haze and by the sea. 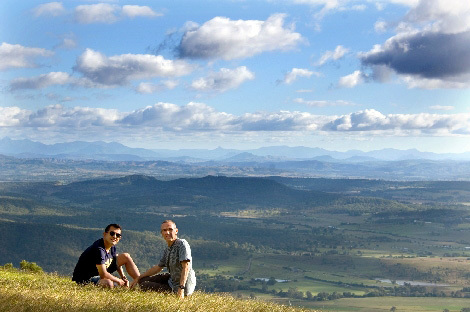 My favourite view of the whole trip and one which made made a nice souvenir photo to frame of myself and friend Paul, was this one from Mount Tamborine looking across the plateau to distant mountains. I spotted it between the trees driving past, hit the brakes, pulled over and set up the camera on self-timer and a high tech tripod (a handy fence post!). What you don’t know by looking at it is that just to the left and behind the camera is a bunch of kids playing, an ice cream van, toilet block, litter bins and a row of cars. Doesn’t it just look like we are in the middle of nowhere? That’s why I like it. Nothing is lost on composition though as I framed it to get us towards one corner, have some foreground grass which gives a nice contrast and depth. I can live with the central horizon which is usually avoided, as I like the sky. Plus, my options were limited due to the camera’s position. It’s really worth the patience and planning when you set up a shot like this. It’s all the difference between it making it into a frame on the lounge wall or just staying in a file on the computer! 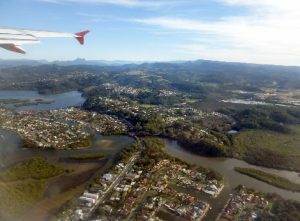 Coolangatta and surrounds from the air. Manly from approach to Sydney. My base for my exploration further north, was the pleasant resort of Coolangatta(left), on the Gold Coast. The airport was right next door, so taking off gave a great opportunity to give a flavour of the surrounding landscape. 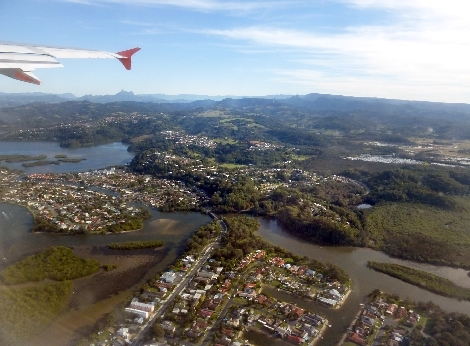 As per Sydney, lots of estuaries, inlets and rivers are a familiar sight along that stretch of Australian coastline. 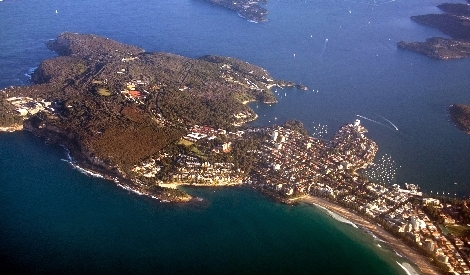 Manly is another delightful seaside resort, not far from Sydney, which made for a great photo as the plane descended towards Sydney airport. This was a lovely souvenir photo to have, as I’d been here by ferry and really liked it. The sun was out and it was clear, giving a superb view of this peninsular of land. 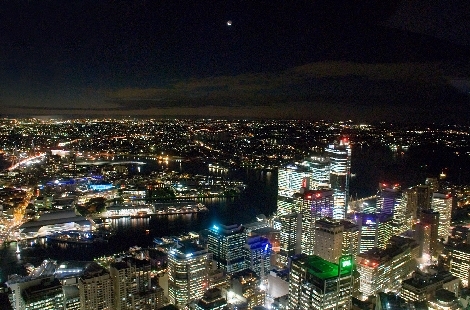 My final shots came from a second visit up the Sydney Tower, this time at night. I had intended being here for dusk, when there’s still a little light and colour in the sky which would have made for better shots, but that plan didn’t quite materialise and I was a bit late. This was camera pressed against the window at 1000 ISO, take a deep breath, hold steady and give it a long exposure of about one second. Using a tripod wasn’t practical, so I took a chance and from a number of attempts got something fairly respectable. It’s fun to compare the daytime views at the top with these night shots. The lovely cathedral below was well floodlit so worked quite nicely as a shot zooming in a bit. I couldn’t risk zooming any more because it would have increased the likelyhood of camera shake. Colour balance was difficult because of the concentration of artificial lighting. I juggled around with the colours in Photoshop, but this seemed best. 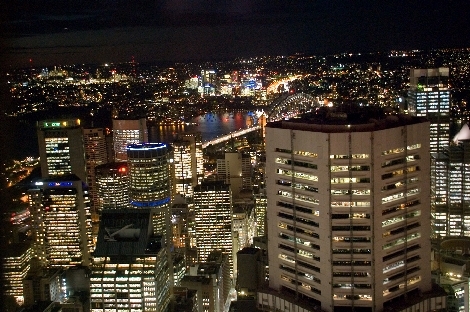 The city was well lit in my last shot, looking towards the bridge. I just wish the ugly skyscraper in the foreground hadn’t been there.